The presence of spas on cruise ships isn’t a new phenomenon. Indeed, several cruise lines are reporting that nearly half of their passengers will have indulged in onboard treatments during 2010. Now it’s all about the spa suites — that is, cabins that fully immerse passengers in the serious work of taking it easy. Here’s a roundup of some of the top options across the cost spectrum, along with the accompanying spa facilities and top treatments. Spa Suites Norwegian Epic offers 39 spa balcony rooms and suites (from $1,699 a person for a week) tricked out with mood lighting and circular beds. Several cabins come with whirlpool tubs; guests gain free access to spa facilities. The Spa Mandara Spa, said to be the largest spa at sea, features 24 treatment rooms (some with private balconies), two couple’s villas, rasul steam rooms, a hydrotherapy courtyard, a thalassotherapy pool, and thermal suites. Botox treatments and teeth whitening services are available. The Treatment The Bamboo Massage relies on bamboo shoots soaked in essential oils to roll and slide tension away (75 minutes, $199). Spa Suites In May, Windstar debuted 10 oceanview spa suites (from $2,359 a person for a week) on its flagship yacht, Wind Surf. Passengers are granted extras like daily tea service and unlimited access to fitness, yoga, and Pilates classes. The Spa The WindSpa features organic O Spa London products; services range from reflexology to cellulite reduction. The spa contains six treatment rooms, plus steam and sauna facilities. The Treatment Spa suite guests are each given an hour-long facial, a 60-minute massage (Balinese, Swedish, or Sports), and a grooming treatment (a manicure, pedicure, or shave). The cost for these treatments is included in the price of a spa suite. Spa Suites Holland America’s newest Signature Class ships (plus a few upgraded older ones) bear top-deck spa staterooms (from $659 a person for a week), most outfitted with private verandas. In-room amenities include yoga mats, iPod docks, and Elemis bath products. 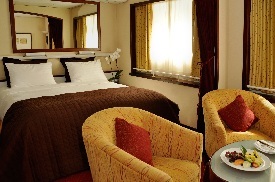 All rooms are near the ship’s spa. The Spa The Greenhouse Spa & Salon has a dozen therapy rooms, a seawater pool, a steam and aromatic room, and a heated ceramic lounge reminiscent of a Turkish bath. The Treatment The Elemis Cooling Hot Stone Body and Facial includes a hot-and-cold muscle massage, followed by an anti-aging facial (50 minutes, $159). Spa Suites On Celebrity’s three Solstice Class ships, 130 AquaClass cabins (from $1,109 a person for a week) lie within steps of the spa. All come with verandas, special bath products, fine linens, a healthful room service menu, and spa access. The Spa The Solstice Class AquaSpa’s two-story, 20,295-square-foot complex sports 24 treatment rooms, sauna and steam rooms, several pools and hot tubs, and the Persian Garden area with heated lounge chairs looking over the ocean. A duo of eateries, the AquaSpa Café and Blu, serve health-conscious cuisine. The Treatment Solstice ships are among the few to offer acupuncture at sea (50 minutes, $150). Spa Suites Three years ago MS Europa added four adjacent balcony spa suites (from $8,290 a person for a week), which serve wellness beverages and snacks by whirlpool tubs with ocean views. Various spa treatments—some offered in guest suites—are included in the rate. The Spa The intimate Asian-themed Ocean Spa features a range of Western and Far Eastern treatment options, along with thalassotherapy applications. The facilities include six treatment rooms, a Japanese bath, a Finnish sauna, and a steam room. The Treatment The Exotic Sense of Well-being package involves a Hawaiian Lomi-Lomi massage, a full-body peel, and a treatment with algae extracts or goat butter. From the Winter 2010/2011 issue of Smart Luxury Travel magazine, by the editors of ShermansTravel.com.